It must have taken writer/director Quentin Tarantino ages to design and shoot the Crazy 88 sequence from Kill Bill Vol. 1, but the end result is worth every minute of his time. Not only is the action brilliant and beautifully shot, the amount of blood and gore in the sequence actually make it quite comical as well, adding a great new dimension. And apparently that humor wasn't lost on the on-set photographer, who took a great series of shots during filming, and now you can check out a bunch of them below. 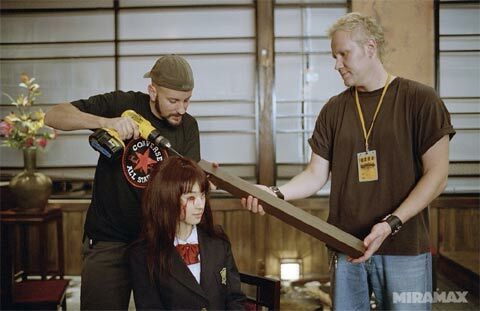 The shots were posted on the official Miramax website (you can see the rest of the gallery over there), and while we regularly get to see behind-the-scene images from the making of movies, it's rare that they are this much fun to look at. 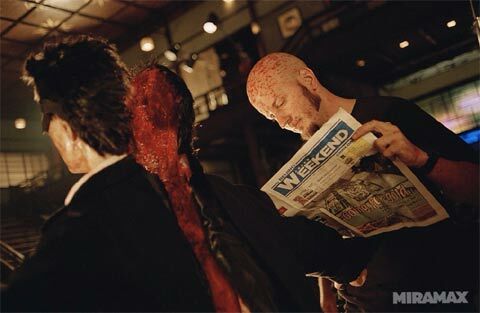 Sure, it's cool that Christopher Nolan took the time to draw the little chalk Batman symbols in The Dark Knight Rises himself, but that's nowhere near as cool as seeing Chiaki Kuriyama get a bit of wood drilled into her head, Uma Thurman hanging out with a partially-decapitated Lucy Liu, or a random dude reading a newspaper next to a dude that has nearly been chopped in half. The real shame is that most people haven't had the opportunity to see the Crazy 88 fight in its full glory. While the theatrical cut of the movie had part of the sequence sheathed in black-and-white as to avoid a possible NC-17 rating, Kill Bill: The Whole Bloody Affair - which is the complete edit by Tarantino that stitches together Kill Bill Vol. 1 and Vol. 2 as one four-hour epic - is not only all in color, but even features an extended version of the fight scene that was considered to be too much for American audiences. The filmmaker has long promised that The Whole Bloody Affair will make its way to Blu-ray and DVD someday, but for now we're just left patiently waiting.